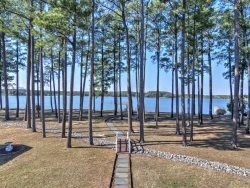 Tranquil Waterfront Destination with Fantastic Outdoor Spaces and Pool! This exceptional destination features a tranquil waterfront pool and open deck with an adjacent pool pavilion… perfect for when you need to seek a little shade but still desire to be outdoors. It’s a fantastic spot to entertain, enjoy gourmet meals, casual snacks, or your morning coffee. Take a walk down to the private dock and settle into one the Adirondack chairs – an ideal location to read a book or enjoy the sunset. Want to get out on the water? A kayak and a canoe are provided for exploring beautiful Boone Creek. The charming town of Oxford is a just short bike ride away. Make sure to stop by Scottish Highland Creamery for a scoop or two of their irresistible homemade ice cream. When you return from your adventure, settle into the hammock… perfect for a relaxing afternoon nap. This premier vacation home offers a large open-air kitchen with a butcher block island where everyone loves to gather, a large dining table, as well as a family room seating area. We love the natural light that pours into the home and the many views of the water. The master bedroom is located on the second floor. The third floor features a gathering room that doubles as a game room. Off The Grid is the ideal destination for those who want to be exactly that… off the grid. Please Inquire with your reservationist about WiFi access. Thank you. Dock Information: Boone Creek. Private Dock 4.5'MLW. Water depth at the dock is 4.5 ft MLW, although there is a controlling depth accessing Boone Creek from the Choptank River which at times can be below 1ft. Water Toys Included: One (1) Canoe and One (1) Kayak. To ensure proper sizing for your group, please bring your own life jackets, or we can recommend a rental agency.